A remarkable early map of New England showing advanced boundaries. A New Plan of New England According to the Latest Observations 1720. This is Daniel Neal's important and scarce 1720 map of New England. Centered on th colony of Massachusetts, Neal's map covers from the Hudson River and New York City east to Nova Scotia, it extend north to Lake Champlain (Lake Iroquois) and south to Long Island and the Nantucket Shoals. Two inset map s in the lower right detail Boston Harbor (with depth soundings in fathoms) and Labrador as far north as Hudson Strait. Although Neal's sources are unknown, the map presents an overall sophisticated panorama of the region. 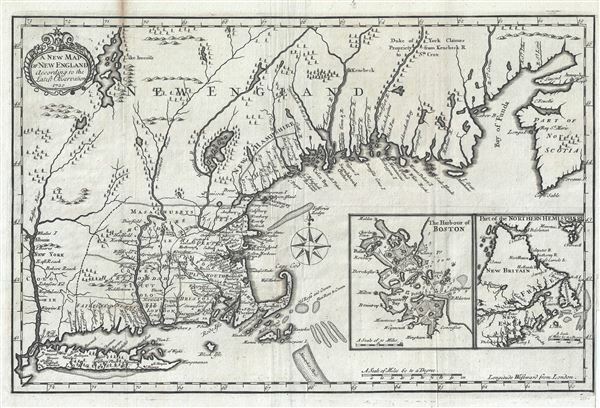 The heart of the map, the Connecticut and Massachusetts Colonies, feature the densest cartography with detail labeling throughout. The cartographer offers surprisingly modern border configuration between Massachusetts, Connecticut, and Rhode Island. To the west there is a clearly defined western border with New York. Plymouth, which had been annexed in 1691 is properly integrated. The border with Rhode Island runs to the south of Bristol County. [Neal's] work was superior to anything of the kind that preceded it. His attitude is that of one who wishes to remain impartial. He deals chiefly with political, religious, and military questions, but has an interesting chapter, largely condensed from Josselyn, describing the state of New England; and he has paid some attention to legislative history. His style is often sprightly and he displays a sense of humor. For some aspects of the revolution of 1688- 1689 his work is still useful. Daniel Neal (14 December 1678 – 4 April 1743) was an English historian. Born in London, he was educated at the Merchant Taylors' School, and at the universities of Utrecht and Leiden. In 1704 he became assistant minister, and in 1706 sole minister, of an independent congregation worshipping in Aldersgate Street, and afterwards in Jewin Street, London, where he remained almost until his death. He married Elizabeth Lardner (d. 1748), by whom he had one son, Nathanael, and two daughters. In 1720 Neal published his History of New England, which obtained for its author, in the following year, the honorary degree of MA from Harvard. Neal, D., The History of New-England, (London) 1747. Very good. Minor wear on original folds. Minor verso reinforcement near margin upper left. Minor closed verso repair lower right quadrant where originally attached to bock. McCorkle, B. B, New England in Early Printed Maps 1513 - 1800, 1720.2.